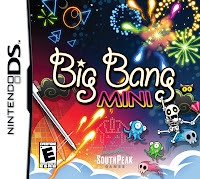 Nintendo DS™ released a new game called Big Bang Mini on January 20,2009 . My to older boys really seem to like this game and between them it seem to be played daily ! When they are at school I have been playing it also but shhhhh.... they do not like Mom touching their DS ! With Big Bang Mini players create their own fireworks displays. Players send up rockets with a sweep of the stylus while avoiding the burning fallout from fireworks which miss their targets. The aim of the game is to collect stars which fall when an enemy is defeated and progress through the game’s 90 levels. This game is rated E for Everyone! And is available at major retailers nationwide with a suggested retail price of $19.99 . This would be a great gift for anyone who loves video games.